Virginia Apgar MD devised the simple observational test that bears her name after watching doctors swiftly give up on struggling newborn babies, leaving them to die, Atul Gawande writes in his book, Better. At the time, a few years after World War II, one in 30 births in the United States ended in the infant’s death. The Apgar score, introduced in 1953, is a 10-point scale for assessing how a newborn baby is doing — first with the birth process, and then with adjusting to the world. It is given in hospitals one minute after birth, and again at five minutes. A robust baby might garner 10 points, but a baby with an Apgar score of four or less draws serious concern and, likely, vigorous intervention. Dr. Apgar’s scoring system transformed delivery, Gawande writes. “Even if only because doctors are competitive, it drove them to want to produce better scores—and therefore better outcomes—for the newborns they delivered,” he writes. 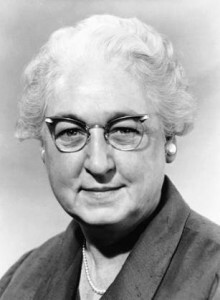 The daughter of a Westfield, N.J., insurance executive, Dr. Apgar graduated from Mount Holyoke College in 1929, and began medical school at Columbia University’s College of Physicians and Surgeons, where eight of her classmates were women and 81 were men. She began a surgical residency but, in the depths of the Great Depression, decided it might be difficult, especially as a woman, to make a living as a surgeon. Dr. Apgar enrolled first in a course for nurse-anesthetists and then in Dr. Ralph Waters’ seminal residency program in anesthesiology at the University of Wisconsin in Madison, followed by a stint with Emery Rovenstine at Bellevue Hospital in New York — strong training for the day. She founded the anesthesiology program at Columbia’s College of Physicians and Surgeons. However, when the program became a department, Dr. Apgar was passed over for the job as chairman, in favor of a man. She did become a full professor, though — in itself an accomplishment at the time — and was a pioneer in obstetrical anesthesiology. Dr. Apgar saw a number of birth defects during the thousands of births she attended, and in 1958 she went back to school in public health at Johns Hopkins’ medical school in Baltimore. In 1959, Dr. Apgar joined the March of Dimes in its campaign to eliminate birth defects. Dr. Apgar never married. Her entire life, she was famous for intelligence, energy, empathy and a great sense of humor. She was still working on behalf of the most vulnerable babies when she died in 1974, at the age of 65, of liver failure. Gawande’s chapter about Dr. Apgar, “The Score,” also ran in the New Yorker. This entry was posted in anesthesia, People and tagged anesthesiology, Apgar score, Atul Gawande, Bellevue Hospital, Better, birth defects, College of Physicians and Surgeons, Columbia University, Emery Rovenstine, Great Depression, infant mortality, Johns Hopkins Medical School, March of Dimes, obstetrical anesthesiology, Ralph Waters, surgeon, The New Yorker, University of Wisconsin, Virginia Apgar by Delia. Bookmark the permalink. what a fascinating blog! Such great info! Oh, and God bless Dr. Apgar. I thank her, as does my 9 point baby gal. Great post – in this day and age to find something like the Apgar score that is still being utilized almost 60 years after it was first introduced is something of a miracle. I remember waiting to hear how my daughter scored when she was born and breathing a huge sigh of relief when it came back as a good score. Thank you for stopping by my blog and for your comments. In late 1970, as a Father with a new born daughter, I was “turned on” by a friend to a book entitled, “The Miracle of Birth” by Virginia Apgar. I read it from cover to cover and was astounded by what she had to say regarding the Miracle of Birth since, in her words paraphrased, healthy births are as close to an accident as one can get! In short, with all of the things that can go wrong in the gestation and birthing process, it is truely a Miracle that humans birth as many “healthy” babies as we do. Excellent book! My reason for writing is to ask; any idea where I can find a copy of this wonderful story? Yes, I have searched the Web and have come up shorthanded thus far. Any help would be appreciated.